Our trips start in two great in Utah. Moab, Utah, is the epicenter of adventure activities in America’s desert Southwest. Some people call it the region’s “Adventure Capital.” With an array of lodging options, the town of about 5,000 has all the services and amenities needed to explore and enjoy the area’s natural wonders. Dining options include national restaurant chains your kids’ love and independently owned bistros and eateries that serve up the popularly spicy Southwestern cuisine, as well as continental favorites. Most of our trips run out of Moab. 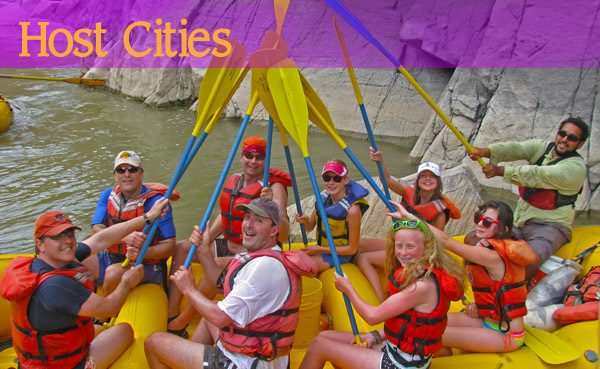 Including all our Cataract Canyon, Westwater Canyon and Majestic Canyons trips. Vernal is located in the Northeastern corner of Utah. Vernal is the heart of Dinosaurland, Dinosaur National Monument is Vernal’s crowning destination. Discover fragments of a long ago world where the largest land creatures of all time once roamed and died. Vernal has several hotels and dinning options. We run our Gates of Lodore and Yampa River trips out of Vernal.